Kenzo, spring/summer 2002 ready-to-wear collection. the Year award, 1976, 1977; Chevalier de l'Ordre des Arts et des Lettres, 1984. Address: 3 Place des Victoires, 75002 Paris. Website: www.kenzo.com . 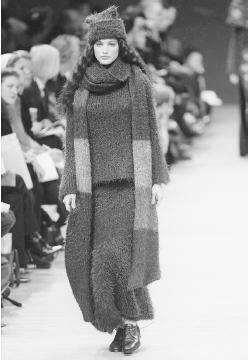 Kenzo, autumn/winter 1999-2000 ready-to-wear collection: wool knit ensemble. By the early 1990s, Kenzo's company, which boasted 37 boutiques worldwide and 124 sales outlets, was acquired by the LVMH (Moët Hennessey Louis Vuitton) family, quickly becoming LVMH's second-largest fashion house after Louis Vuitton. LVMH also owns Loewe, Celine, and Christian Dior. Plans for the Kenzo brand included branching into home furnishings and launching a new sportswear line called Kenzo Ki ( Ki is Kenji for "energy").